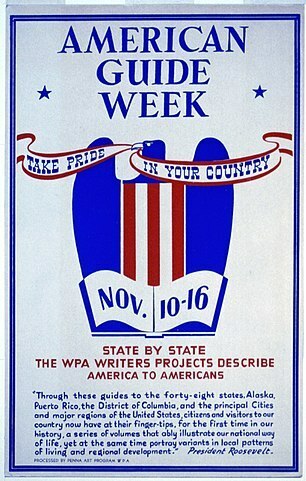 New Deal; Works Progress Administration; WPA; Federal Writers' Project; FWP; Federal Project One; American Guide Series; American Guide Week; Posters. The image is of a New Deal poster advertising American Guide Week from Nov. 10th-16th. Pennsylvania : Penna Art Program, Works Progress Administration (WPA), , “American Guide Week Poster,” USU Digital Exhibits, accessed April 20, 2019, http://exhibits.lib.usu.edu/items/show/18778.